We are delighted to welcome you to the Craigton Cottages website. We are based close to the Bonnie banks of Loch Lomond, surrounded by wildlife and serene beauty with an abundance of leisure activities right on our door step. There is something for everyone from the action-packed to sedate. Try the many watersports on offer, enjoy magnificent views from Ben Lomond, cycle the Loch Lomond cyclepath, play golf, visit historic houses and gardens… Based at Craigton, you’ll be spoilt for choice. 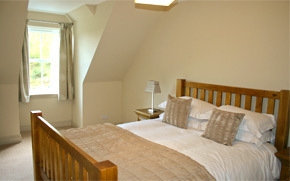 Quarry Cottage has a master bedroom with King-size bed & en-suite plus a twin bedroom and separate bathroom with shower. Open-plan kitchen with oven & hob,dishwasher, fridge and freezer. Utility with washer & drier. 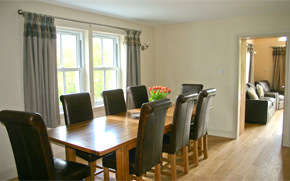 Spacious living/dining area with wood-burning stove and patio doors leading to garden with seating area and barbecue. Quarry cottage has level-access doorways and is all on ground floor. Piper’s Cottage has a master bedroom with king-size bed and en-suite showerroom on the first floor.On the ground floor there are two twin rooms and family bathroom with shower. Kitchen with oven & hob, dishwasher, fridge and freezer opens onto spacious living/dining area with woodburner and patio doors leading to garden with seating area and barbecue. Utility with washer and drier. 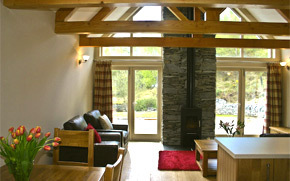 Cruach Dubh – Ground floor twin bedroom has en-suite bathroom with separate shower. 3 further bedrooms upstairs; one king-size bed with en-suite showerroom, one king-size bed with en-suite bathroom including separate shower, one twin room plus family bathroom with shower. Lounge with woodburning stove and patio doors leading to garden with seating area and barbecue. Spacious kitchen with range cooker, dishwasher & fridge/freezer leading to bright dining room. Cloakroom toilet and utility with washer and drier. Well-behaved pets are welcome at our discretion and will be subject to a surcharge of £30 per pet per week.